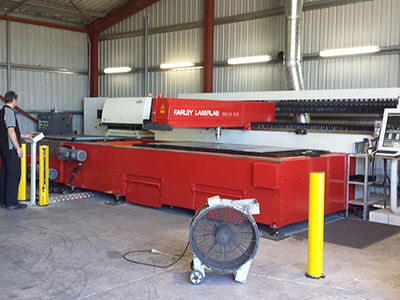 The Farley Laserlab Trident is a large footprint multi-torch cutting machine designed to deliver precision, high definition plasma cutting, oxy-fuel cutting and drilling. shops that require continuous operation – 3 shifts per day, year after year. The Trident is one of the thoroughbreds of the Farley stable and achieves its accuracy and high productivity by utilising single piece fabricated beam construction, which eliminates bolted joints. Combined with twin side-drives through high precision planetary gear boxes, the result is a machine light enough to achieve plasma profiling speeds of 20m/min yet retaining the rigidity to accept up to 6 torches for multi-torch plate cutting of 250mm thick material. the capacity to drill 32mm diameter holes. > The low level rail construction improves accuracy and stability while reducing the chances of damage from swinging loads on cranes and forklifts. > Low rails improve operator access, speeding up loading and unloading and reducing potential safety problems. > AC servo drives and planetary gearboxes provide the torque and resolution necessary to ensure accurate position through the life of the machine. > The drive system ensures high stiffness essential for accuracy, minimal backlash and easy adjustment. > Optimum acceleration is ensured through the use of Siemens AC motors. > Twin drive system ensures torch accuracy. > BT40 tool holder, accommodating 8 tools. > The rack & pinion primary torch carriage can be fitted with up to three lifters, to accommodate the plasma torch, oxy-fuel torch, marker and centre drill. > Up to three additional slave torch carriages can be fitted. These are driven by the primary torch carriage by a stainless steel band and can be configured for various tools.